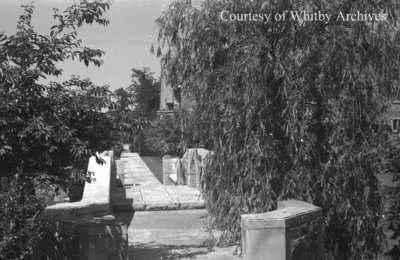 A black and white negative of the top of the stone bridge and walkway at Stonehaven taken in July of 1939. A corner of Stonehaven can be seen in the centre of the photograph. Stone Bridge at Stonehaven, June 1939, Marjorie Ruddy. Whitby Archives A2013_040_705C.